Arteriosclerosis is the hardening or thickening of the arterial walls by free phagocytes cells, fat debris, and cholesterol. 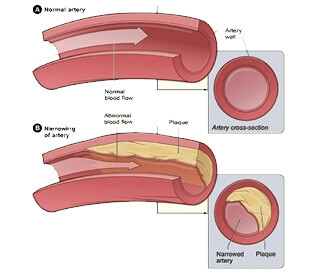 This build-up is called atherosclerotic plaque. Atheromas or plaque deposit in the inner wall of the arteries damages the elasticity of the connective tissue of the walls of veins and arteries, but with the right nutrition, it is possible to prevent the underlying smooth muscle cells of the arterial walls from becoming damage, and if it is, depending on how long you’ve had it, essential nutrients and non nutritive properties in our food that fight degenerative disease can reverse the damage done to the connective tissue of the arterial walls, and help the body to clear itself of atherosclerotic plaque. The connective tissue of the walls of veins and arteries consist chiefly of elastic fibres, which helps to regulate the pressure in the blood vessels, but the hardening or thickening of the inner arterial walls by free phagocytes cells, fat debris, cholesterol deposit and a lack of Vitamin Cdamage the elasticity of the connective tissue of the walls of veins and arteries. Without healthy elastic blood vessels that stretch and shrink in order to push the blood to the vital organs of the body as the pressure goes up and down in the blood vessels when the heart beat and relaxes between beat, the risk of developing hypertension, diabetes, heart disease, stroke, multiple sclerosis, retinopathy, (a disease of the retina that can result in lost of vision), and kidney failure increses dramatically. One may reverse Arteriosclerosis by eating less red meat, shellfish, dairy, sweets and refined baked foods and eat more whole foods, especially foods rich in soluble fibre like oats, legumes, psyllium, nuts, plums, apples, grapefruits, orange, carrots, strawberries, soy beans, apricots, dates, raisins, flax seed, and beets along with a natural treatment of soluble fibre supplements such as pectin found in fruits like apples, and in high concentration in citrus rind. Soluble fibre increase the excretion of bile acid from the body. The removal of bile acid from the body in turn stimulates the production of more bile acid in the liver. Now, because bile acid is produced from cholesterol, an increase in bile acid would cause the body to use up stored cholesterol. Thus decreasing the total blood cholesterol level.